A photograph (also known as a photo) is an image created by light falling on a photosensitive surface, usually photographic film or an electronic image sensor, such as a CCD or a CMOS chip. Most photographs are created using a camera, which uses a lens to focus the scene's visible wavelengths of light into a reproduction of what the human eye would see. The process and practice of creating such images is called photography. The word photograph was coined in 1839 by Sir John Herschel and is based on the Greek φῶς (phos), meaning "light," and γραφή (graphê), meaning "drawing, writing," together meaning "drawing with light." Non-digital photographs are produced with a two-step chemical process. In the two-step process the light-sensitive film captures a negative image (colors and lights/darks are inverted). To produce a positive image, the negative is most commonly transferred ('printed') onto photographic paper. Printing the negative onto transparent film stock is used to manufacture motion picture films. Panoramic format images can be taken with cameras like the Hasselblad Xpan on standard film. Since the 1990s, panoramic photos have been available on the Advanced Photo System (APS) film. APS was developed by several of the major film manufacturers to provide a film with different formats and computerized options available, though APS panoramas were created using a mask in panorama-capable cameras, far less desirable than a true panoramic camera, which achieves its effect through a wider film format. APS has become less popular and has been discontinued. ^ "The First Photograph - Heliography". Retrieved 29 September 2009. from Helmut Gernsheim's article, "The 150th Anniversary of Photography," in History of Photography Vol. I, No. 1, January 1977: ... 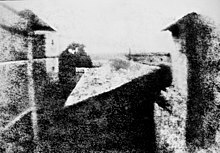 In 1822, Niépce coated a glass plate ... The sunlight passing through ... This first permanent example ... was destroyed ... some years later.